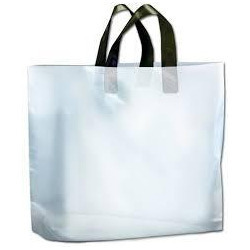 Keeping in mind the trends taking place in this immensely competitive industry, we are engaged in delivering a wide variety of Loop Handle Carry Bags. Making use of superior-class basic components altogether with futuristic techniques, machinery and tools, these presented products are made up with excellence. In addition, these are reviewed properly before being dispatched at the doorsteps of our clients. Established in the year 2011, Heena Plastics is a distinguished trading, supplying and wholesaling an enormous consignment of products comprising Polypropylene Products, LDPE Products, HDPE Liner Bags, Carry Bags, BOPP Bags and many more. Enormously acclaimed in the industry owing to their precise design, perfect finish and durable nature, all these products are presented by us in standard and modified forms to our clients. In addition, only optimal-class basic material is utilized in their production of these products. These presented by us in several provisions, these are inspected sternly to retain their perfect finish and could be modified to match with varying demands of our respected patrons.